One popular link building tactic for blog owners and businesses alike is guest blogging. It's kinda been done to death but still offers some really high quality link building opportunities when it's done correctly. I've spent a lot of my time over the past year building relationships with influential blog owners and writing content for them. Guest blogging shouldn't be seen as a one-off event on a blog; you should be looking at becoming a regular contributor and tapping into the site's community to increase your online reach. Another mistake that many bloggers make is to only look for guest blogging opportunities based on domain metrics like 'Domain Authority', a method that I've succumb to in the past. We should be looking for websites with an engaging audience and an active social media following; websites that are likely to get our content seen by more people within our niche. Once I've got an idea of the influential writers within my niche, it's time to 'follow their paper-trail'. This uses the same principles as a common SEO technique, the competitive link analysis. In a competitive link analysis we would look at some of the websites that we are competing with for keyword rankings in the SERPs and then find out who links to them - this is so that we could try and also gain a link from the same site. Unlike with this method, we're not going to be looking at the paper-trail that websites leave, instead we're going to be looking at the content writers themselves to find out where they have gained guest posting/regular contributor opportunities and then try to establish these for ourselves. This will probably seem so obvious once you read this, but by simply checking out the Google+ profile of the influential content writers that we've identified, we can find out a load of the websites that they've had their content published on. 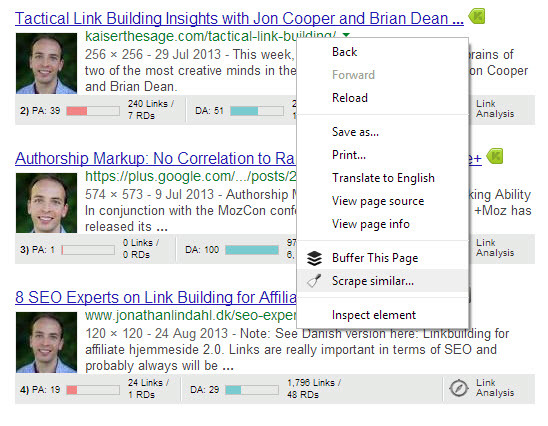 The next step that I take is to use the Scrape Similar plugin for Chrome to quickly scrape the links from the page and add them into a spreadsheet. This way, you're able to start building a good list of link prospects as well as identifying websites that have accepted a few of your targets for guest posts - these might work out to be easier targets. This method is another that relies on Google Authorship being set up from the targets that were outlined in the initial author prospecting (in the video above). I also need to give a hat-tip to Brian Dean of Backlinko for this method. The first step is to locate the Google+ profile of an influential writer and grab the URL of their profile image. Once you've gathered the Google+ profile image URL , take a trip to Google Images search and click on the little camera icon to 'Search by image'. 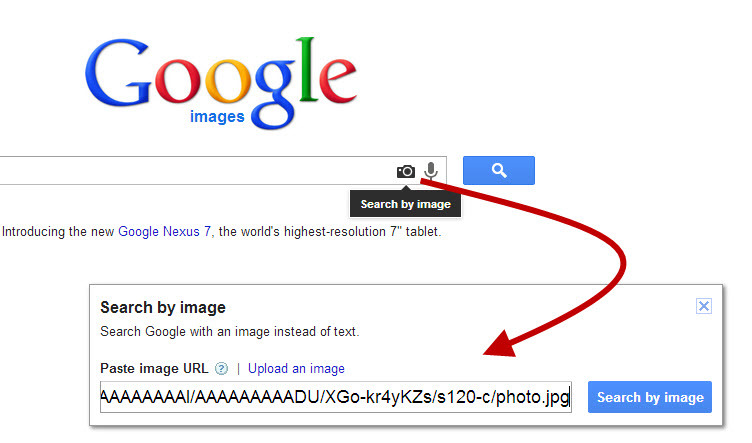 You can then paste in the image URL and press the 'Search by image' button. You'll now be left with a juicy list of link targets that you can scrape via Scrape Similar and add to your spreadsheet - thanks Brian! The final technique that I use caters for websites that may not have set up Google+ authorship on their guest posts - which is fairly common within niches outside of digital marketing. One commonality that nearly all guest posts share is an author bio. 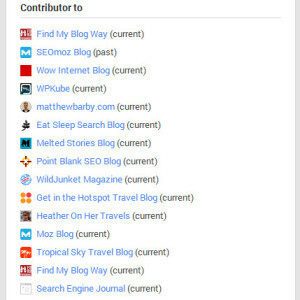 As well as this, most blogs will have an author archives page that lists all of the posts from any given author. Whenever we're trying to follow a paper-trail, it's these commonalities that become important, and it's here where we call on one of my favourite tools - Scrapebox. intext:"SEO & Social Media Strategist at Wow Internet"
The above footprint is my own job title which, like many others, I state within my Twitter bio. Luckily for us, we've pulled off the Twitter bios for all the influential targets we found via Followerwonk. This should, when searched for, display a list of websites where I've disclosed this line within my author bio. Step 2: Once I've put together my list of footprints, I add these into ScrapeBox so that I can search for a load of the different author's guest posts at once, saving me loads of time. From just a 20 second wait and eight different footprints related to four different authors, I've managed to gather 1,154 URLs. The next thing I'll do is filter out the duplicate URLs within ScrapeBox and export all of them into an Excel spreadsheet. An hour's work here can result in some seriously good link prospects - give it a try and let me know how you get on! What a great post. We’re actually using a BPO to do this manually at two cents a name+URL+byline but we may try this as an alternative. Hey David, yes, you can get great results using this method – some niches work better than others but I’ve found some real gold with this. Nice post Matthew. I’ve been experimenting with scrape box and it has been excellent. Also, download the little mailbox button that several sites typically accepting guest posts utilize for their contact us page (especially mom blogs), reverse image search, and tack on a keyword related to the niche you’re focusing on. I.e, reverse image search the mailbox button + interior design. Hey Nicholas, thanks for the comments. Really like your idea of searching for the mailbox button – this could work well if you identify a specific WordPress theme that is used a lot within certain niches and use that as a footprint too. Don’t you think the domain authority matters? Doesn’t it show that they are probably doing something right? I am not excluding making sure that they have an engaged audience and are related to your niche. It’s not that I think Domain Authority “doesn’t matter”, but it certainly isn’t the be-all and end-all. Too many ‘link builders’ are focusing solely on these types of metrics, when in reality there are a lot better ways to value link opportunities. Domain Authority is a good starting point or benchmarking metric but I would take a link from an engaging community website with a DA25 over a site that is DA50 with no engagement at all. The tiered effect of link building is just as important as direct links – high engagement blogs encourage these types of second tier links and have the potential to become more powerful over time. I now understand you better Matthew. Thanks for clarifying. Using advanced search operators like you’ve mentioned is a great way to you can usually quickly scrape all the sites they have posted to. Thanks, Steven. You can pretty much do anything in internet marketing with a quick Google search haha! yeah that’s what they want (dammit!) Ontolo is good as well you can load up all the advanced operators in there, leave it overnight and then go through when you have time. Take s abit of the grunt work out of the process. So so delighted that i found this site. You cannot imagine my excitement, because what i have benefited within five minutes of been here is awesome. Thanks for sharing. Great post Matthew. Going to get my Scrape on. delicious. And certainly, thank you for your sweat ! increase my knowledge. it is nice to know this. Thanks for the time and effort .